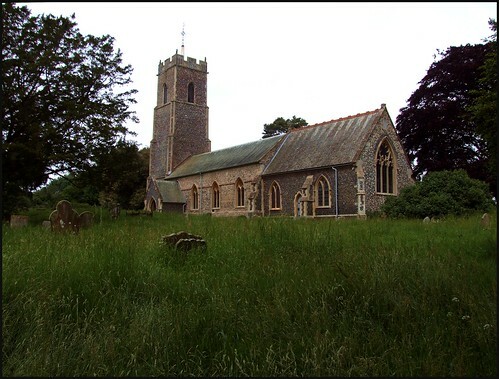 Campsea Ashe is a parish which many people will have passed through without realising it. This is because the Ipswich to Lowestoft railway line has a stop here, but the station is named for the town of Wickham Market, a mile and a half away. The railway line and its bridge makes for something of a split village. But it is an interesting place, with an interesting church. St John the Baptist is set near the centre of the village, and apart from the 14th century tower appears to be entirely a 19th century rebuilding, the chancel about thirty years after the nave. In fact, this is not the case at all. The nave windows were replaced in the 1860s, and the chancel was refaced in flint, and vestries were added, a few years after. I came back to St John the Baptist in the late spring of 2008. It would turn out to be a fine day, with full sunshine by the time I reached Easton a few miles off, but as I got off the train the clouds were low. The birds obviously hadn't decided which way it was going to go yet, and the church graveyard felt a secretive, silent place. I'd first come here around the turn of the millennium, with my seven year old son, James. He had found the graves to the Lowther family on the south side of the church, with moss growing inside the indented letters, like inlaid jewels, or as if someone had sprinkled a packet of seeds in the shapes of words. James is fifteen now, and the moss has thickened and spread, but still the words are discernible. Like all the churches in this area, St John the Baptist is open every day, and you step into a church that presents itself at first as being like a long tunnel under its white ceiling. However, the late 19th and early 20th Century glass alleviates this, and is jewel-like in such a setting. The best of it is a window by Henry Holiday, perhaps the finest of all the early Arts and Crafts artists, depicting Faith with her cross, and Hope with her anchor. There is more of his work across the county at Shimpling. The east window is also very fine, by Powells in 1912, depicting the risen Christ in Majesty, with six saints at his feet. The left hand three are Saint John the Baptist, the Blessed Virgin Mary and St Peter. On the right is St Hilda, who represents Yorkshire where William Lowther's wife was born, St Edmund for Suffolk, and St Oswald for Cumberland where the Lowther family seat is - thank you to Andrew Cadman for that information. The glass is a memorial to the Lowther family. The Lowthers are everywhere in this church, most notably on a fine memorial in the 17th century style. This is in extraordinarily good condition; and so it should be, since on closer inspection it proves to date from the early 1950s. When you know this, you can detect a certain Festival of Britain quality to it. As a one-off it is rather charming. The grandest memorial here is to Frederic Sheppard, who died at the Battle of Badajoz in 1812. His army days took him from the Siege of Copenhagen to Portugal, and then to the retreat from Salamanca; he carried the King's colours at the memorable Battle of Corunna, took part in the expedition to Zealand where he beheld the fall of Flushing, and then fought at Gibraltar and Cueta on either side of the Mediterranean. He finally ran out of luck when he received a musquet ball thro' his thigh, of which wound to the universal regret of his regiment he died six days after... and his remains were honourably interred on the ramparts where he so gloriously fell. Remarkably, after such a distinguished career, he was just 22 years old. Not far from the busy Sheppard lies Emily Mair, the devoted nurse and friend of the family of Lord Rendlesham. She died in 1895, and the carving on her memorial is a superb piece of late Victorian sentiment. The inscription, not unnaturally, is far too gallant to mention her age.